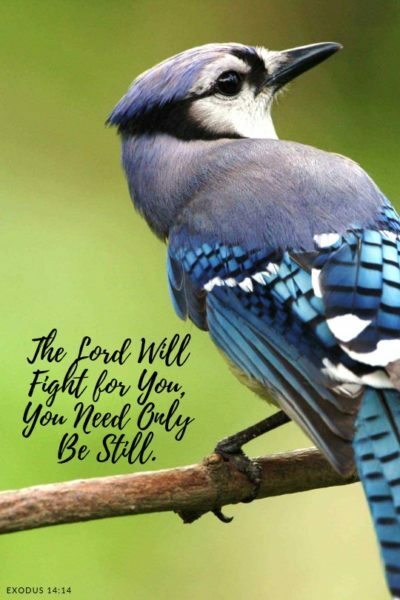 Does God Truly Fight Our Battles? There are times in all our lives when we are tempted to ask this question. The world around us feels like it is falling apart as we lose a job, have our name slandered, or worse yet, lose someone we love. In the Word there are many instances where God fought the battles of those who followed after Him. Of imperfect men and women that He favored, fighting their battles for them. Fighting battles as he still does for us today! There are times when God will come in with a company of angels to turn the tide of the battle, but there are many times when God comes in with His gentle love—or even a single angel—to speak into our lives or protect us from harm. Daniel and many others from Judah were taken captive by the Babylonians not long before the 586 BC capture of Judah and the destruction of the First Temple. There, in Babylon, it was common for the king to enact laws regarding worship… when, where and who could or could not be worshipped. Because of these laws, those of God’s people who refused to pray to other gods—praying to their God alone—were often found out by those around them and exposed to the king, forcing dire action. No law put into being by the king could be revoked—even by the king. In these times of trials there were two events that most of us are well familiar with. 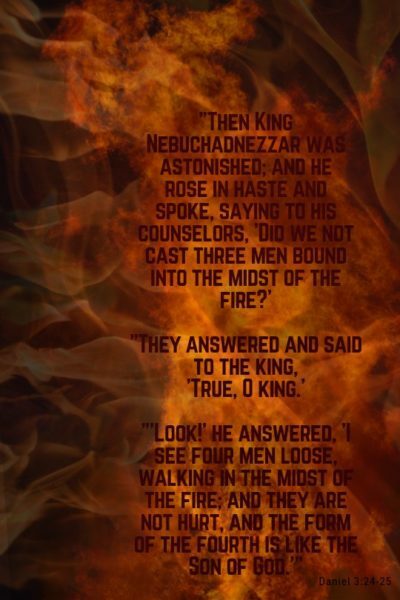 One being the incident with Daniel’s friends—Shadrach, Meshach, and Abed-Nego—who refused to bow to false gods, and the other incident, of course, being Daniel cast into the lions’ den. In both these instances the Lord sent to His followers a single angel to guard and protect them, aweing the kings of Babylon and proving that God is Lord! “Then Nebuchadnezzar was full of fury… He spoke and commanded that they heat the furnace seven times more than it was usually heated. And he commanded certain mighty men of valor… to bind… and cast them into the burning fiery furnace. They had faith even before the battle that the Lord would be the one to fight it for them! 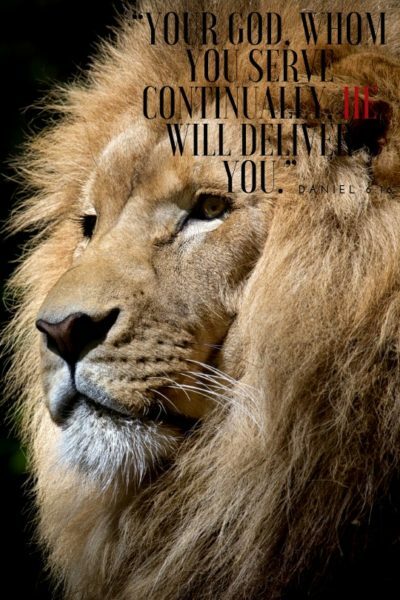 Daniel, likewise, had faith that the Lord would defend him in the lions’ den, as did even the king of Babylon! When men brought Daniel up on charges of not obeying the king’s law that for a certain period only the king could pray, the king was greatly distressed—for he did not desire to see harm befall Daniel. So, the king tried to find a way to alter the edict. Being unable to do so, he not only spoke to Daniel that His God would protect him, he even spent the night—while Daniel was in the lions’ den—fasting, praying, and refraining from sleep. Arising in the morning to find that Daniel had survived, the king was overjoyed to hear that Daniel’s God had sent an angel to shut the mouths of the lions! For instance, when Hannah—who would become the prophet Samuel’s mother—was barren and being tormented not only by the other wife of her husband, but by her own mind and heart, prayed to the Lord, He answered her prayer… fighting her battle and giving her a child. What the enemy means for ill, the Lord certainly means for good—we just have to keep our eyes on our Father, remembering who He is! Even today, for us as Believers, the Lord fights our battles as He did in days of old, just as He continues to fight the battles of His children in Israel—our Jewish brothers and sisters. As the enemies that surround Israel try to destroy her, the Lord fights for her and her people, bringing them through their 70th year as a nation! Today, YOU can bless the children of Israel and celebrate the victory of the Lord in bringing His children through 70 years as a nation—for restoring the promised land to them and to us! By sponsoring an olive tree through My Olive Tree YOU are bringing jobs to God’s children! YOU are fulfilling the Word of the Lord, bringing the land and His people back to life… creating a legacy of hope in the Lord! A legacy of knowing that the Lord will fight all of our battles! and a mezuzah, so that the Word of the Lord is always greeting you as you go in or out—a reminder that the Lord will never leave you. Let us stand together in faith, renewing our hope as we realize that God is the fighter of our battles, our defense in times of trouble! Let us remember that the battle belongs to the Lord!